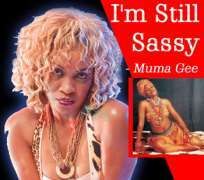 Muma Gee has been an artiste ever since she was 19 years old. The University of Port-Harcourt graduate became famous, courtesy of her single titled Kade, which turned to be the toast of all the television stations in Nigeria. In this interview with Sandra Okafor, she speaks about her source of wealth, genre of music, marriage plans and other parts of her life. After Kade you went into oblivion, what has been happening to your career? Kade is an album; we have been working very hard to ensure that we shoot the rest of the videos. For us to achieve that kind of quality again, we need to take several months to shoot the video CD of five tracks. You don't expect us to come out every two weeks with new videos; we don't do that because we take our time to shoot videos. We have been working on the videos of the rest of songs in Kade. I am still in the studio, currently working on my new album. How will you classify your kind of music? How was the acceptance of Kade by Nigerians? They accept my music very well, everyday I get several mails from people, commending me for a job well done. Fela came out with Afro-beat and it actually took him many years for people to accept his kind of music, because the genre was different from normal Yoruba Juju, Apala, Fuji kinds of music. But today Afro is a household name and the genre of my music is becoming a household name too. How do you manage a 22-man band on stage? It's tough but I am used to it. You relocated to Lagos from Port Harcourt and in less than two years you have achieved what a lot of other artistes could not achieve in a decade, what's the secret behind the sudden success? I am a hardworking business woman; I am not just a musician. You and I know that just being a musician will take care of all my needs, because the shows don't come regularly and the industry is still growing. The Rav4 you saw in my garage, I have been driving it for 10 years. If 10 years ago, I was driving a Rav4, if you consider the gap you will not tell me that all of a sudden I am driving Infinity. Ten years ago, I was driving Rav4, while some other people had not started. I started life early, my father was in the army, I lost him along the line, and I had no choice, but to work hard. Then, I was doing contract, I had buses, I was into bus leasing, I don't see why people should be surprised about my status and before I relocated to Lagos, I worked hard in Port Harcourt and gathered some money before coming to Lagos. I used to own businesses like food and snack shops known as Grops in Port-Harcourt. I used to run a beauty salon known as Black Attraction Beauty Veil. I closed down all these businesses because I wanted to relocate to Lagos and, of course I was making money. I knew that since I lived in a duplex in Port Harcourt, I shouldn't live in anything less than that in Lagos. I don't sit down and wait for a man to give money; no man gives anyway. I don't depend on men. No matter how rich you are, no man can give a woman the kind of money she needs to put herself together. There is nothing like sudden change, I was more comfortable in Port Harcourt than I am in Lagos. As a graduate, you could have done something else, so why the choice of music? I wouldn't have done anything else, because as a child I started singing from the church. My family wanted me to study Medicine and I chose to do music, they never liked it and I had to run away from home. Despite the fact that I ran away into the streets, I refused to be wayward. I decided to live a decent life and that has paid off. Looking at all your achievements as a single lady, do you feel fulfilled and when are you going to settle down? I am extremely fulfilled and I give God the glory and very soon I will get married. In life, you can't do two things at a time, you have to do one first and do the other later. Otherwise, both of them will suffer. I am an African woman and I believe in womanhood so much that, I believe that God created woman to help a man and if that duty is not being fulfilled, I will feel that I have committed a sin. I have chosen to get married to my career at least for a few years, and I have already spent two years and maybe in another one or two years I can get married. What will a trip to your wardrobe reveal? Terrible, because I have a lot of weird clothes and my combinations are something else. I am highly inspirational on stage, that is how I am fashion wise. I just put on what I feel I should wear, not thinking about what others people feel or say about it. On stage, you are energetic; do you take drugs or any other kind of stimulant? I don't; I am naturally high, I don't smoke, I don't drink, I don't even take drugs, I am scared of taking drugs even when I visit hospitals. I am highly energetic on stage and that is because I am happy making people happy. Making people happy gives me the energy I use on stage.